This post forms part of a series on hive comparisons. After the size (volume and box dimensions) and the shape of the hive which we discussed in Part 1, the next level of consideration is the size (area) of comb supported by the hive. Top bars - these are simple, horizontal bars of wood held in place in a rebate at the top of the hive box. 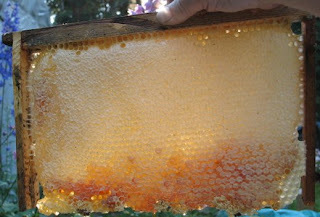 The bees attach the top of the comb to the underside the bar and are free to build downwards in any way they wish. They may or may not attach the sides of the comb to the sides of the hive boxes. 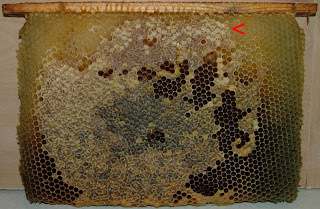 They usually leave a space at the bottom of the comb, just above the floor of the hive or the bars of the next box below. Frames - this is a four sided frame, usually (but not always) made of wood. 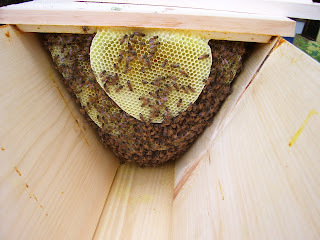 It has two lugs at the top which allow it to be suspended from the rebate a the top of the hive box. The frame hangs suspended inside the box, with a 'bee space' all around it - rather like a folder in a suspended filing cabinet. The bees attach the top of the comb to the (inside) top of the frame, the sides to the (inside) sides of the frame and the bottom to the (inside) bottom of the frame. Langstoth hives were designed specifically for use with frames. Warre hives were designed for use with top bars (lower pic) - but also had an alternative design specification to accomodate frames (upper pic). 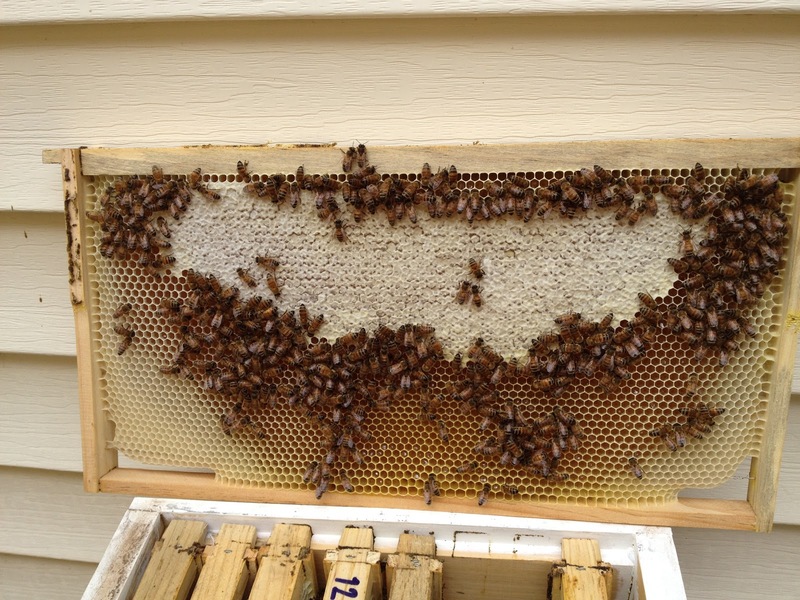 In the top bar version, the bees generally attach the comb to the hive box walls. Kenyan hives were designed for use with top bars. Some people are experimenting with frames in Kenyans. With top bars, the bees generally do not attach the comb to the sides of the hive, except for combs full of honey where they may make a small side attachment at the top. These figures count both sides of the comb - i.e. the total area of cells. For typically configured hives of 4 boxes - both variants of the Warre hive actually accomodate 90% of the comb area that the much larger Langstroth hive does. The Kenyan provides 81% of the area of the Lang. We can now make a comparison of the hives' dimension characteristics by combining the results of volume with the results of comb space by calculating a ratio. That ratio is the amount of hive volume per unit area of comb. Why is that important? 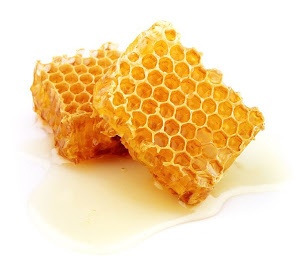 The more 'non-comb' volume there is in a hive, the more energy and resources (bee time) the bees have to apply in order to keep the comb, brood and themselves warm. 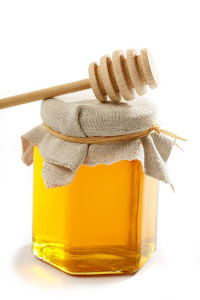 More energy use = less honey stored and more stress on the bees. Langstroth (frames) - 25.67 litres. 30% more than the top bar Warre . . . This means that, inside the Warre, the bees have much less volume to maintain at a given temperature. The wood of the frame takes up a remarkably large volume inside the box. The frames inside a typical Lang take up 11.5 litres of space - that's around 10.5% of the volume. The bees need to keep that volume of wood warm. 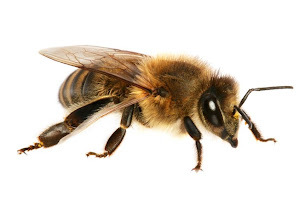 Frames require a bee space around each side (see Post 7), otherwise the bees with propolise of comb over any gap and attach the frame to the hive box wall, rendering it immobile. In hollow trees, the bees build comb upto the edges of the hollow. Interestingly, the Kenyan performs on a par with the framed hives in this regard. This is because the bees (usually) leave their own bee-space around three sides of the comb. This is a design feature of the Kenyan (the sloped sides) to allow the combs to be easily removed (easier than the Warre TB at least). The Kenyan may compensate for this lower performance because, as a horizontal TB hive (HTBH), it has different heatflow charateristics to a vertical TB hive (VTBH) such as the Warre?